When looking for a new breakfast idea, I happened upon a ricotta pancake recipe that I was interested in. And then I remembered the almond meal in my cupboard and decided to try to use it too. What came out is a fluffy pancake, just lightly sweetened, with good lean protein, and healthy fats. serves 1. may double for 2 or to freeze and make an easy 2nd meal! Combine the dry ingredients of almond meal, poppy seeds, baking powder, along with the ricotta, lemon zest, vanilla, and honey. Stir well to make a well blended mixture. In a separate bowl, whip the egg whites - I used my stand mixer. Gently stir in half of the egg whites into the other mixture, and then even more gently fold the rest of the egg whites in to keep things fluffy. Heat large frying pan over medium low heat and add oil. Spoon small mounds into the pan - I got about 5 pancakes in my largest pan to give them plenty of room to be turned. 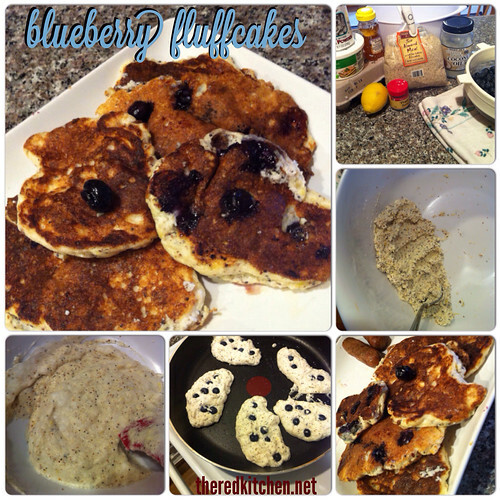 Press blueberries into each pancake. Cook 3-5 minutes per side. Serve and enjoy!